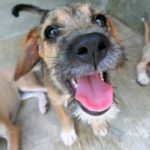 Peludita and her sisters were rescued from a terrible place for dogs. Their lives were in danger there, so they came into rescue. She is a lively little girl with typical puppy energy, and very loving and sweet. She already knows how to walk on a leash, sit for treats, and how to wrap a human’s heart around her little paw.